Pink Diamond realizing the mess she’s made. Cartoon Network’s seemingly random drops of Steven Universe have always been an exercise in measured torture. For all of the carefully crafted world building the show’s creative team is bold enough to take upon itself, the effect has oftentimes been lost and hamstrung by network’s apparent hostility toward the show (at least, in terms of scheduling). In last night’s hour-long “Battle of Heart and Mind,” though, Steven Universe was a triumph that couldn’t be bubbled. 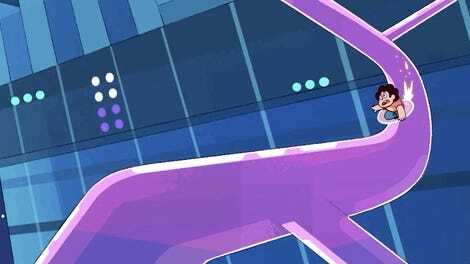 To be a fan of Steven Universe is to exist within a space that’s obsessed with sussing out the details of events that have not yet happened. Through the kind of narrative magic that can only exist when a creative team is actively working for it, “Battle of Heart and Mind” understands that in a way that transcends one specific narrative. There are few things about “A Battle of Heart and Mind” that feel distinctly surprising in the sense that they’re totally unexpected. But on the whole, the event feels very much like a thesis statement about the message Steven Universe has always championed—that even in the darkest, most perilous moments, loving friendships can win out and become the ultimate weapon and creative forces of change. In the face of the Diamond Authority, Steven has tried—tried—to be the vision of diamond-esque perfection they needed his mother to be, but that was never really something he or Pink Diamond were capable of. That core tension, the concept that Pink was always a differently-cut gem among her peers, has been one of Steven Universe’s prevailing themes for some time now, but seeing Steven reckon with it (in exactly the way you’d expect him to) somehow makes it feel like so much more. 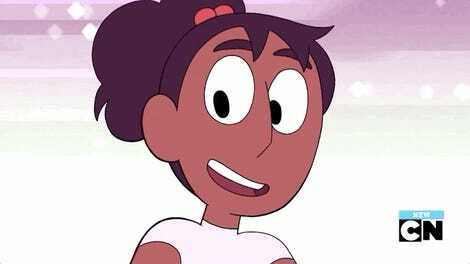 The show’s short, episodic structure, even in this hour-long event, makes it so that there’s only but so much time until Steven and Connie are freed from their prison to rally against the Diamonds in any real way, and their first endeavor is, unsurprisingly, not at successful as they anticipated. But, for all of its tributes to epic (and incredibly anime) battles, “Battle of Heart and Mind” is a relatively simple hour of television that makes you appreciate just what all Steven Universe is about. Free of the Diamonds’ grasp, Steven and Connie are able to plead humanity’s case to largely deaf ears, but their endeavor—especially Connie’s—has an effect on the Diamonds that embodies Steven’s belief that all people can be saved. Subtextual as it might’ve been in the past, the Diamonds have been hurting for thousands of years, and it’s only through Steven’s intervention that they’re able to address their emotional dysfunction. Beneath all of Yellow and Blue Diamond’s elegance, there’s an all-too-human kind of pain that stems not just from Pink’s disappearance, but also from their shared experience living beneath White Diamond’s rule. Powerful as they are, Yellow and Blue, being traditional gems, don’t fully understand just how oppressive living with White is in the grand scheme things. In the same way that Blue Diamond is able to make others feel her feelings, and Yellow makes her feelings understood through violence, Pink Diamond’s unacknowledged power has always been making others see things from her perspective. 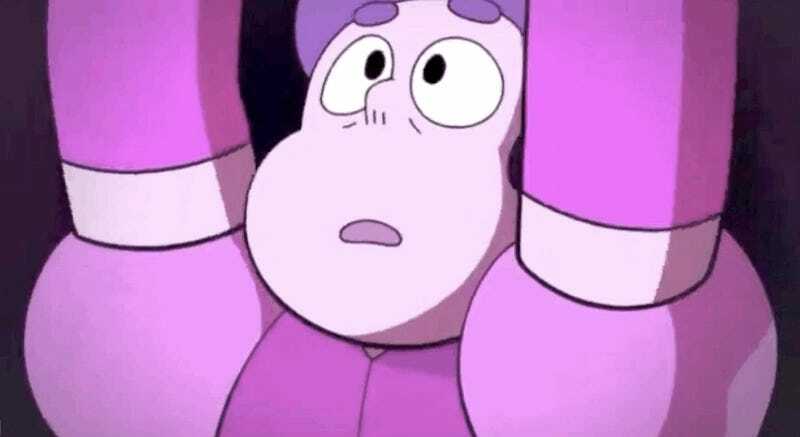 As little as Steven knows about his mother, he’s every bit her son, and finds his strength in trying to appeal to the inherent goodness he believes all people, gem or human, have within them. It’s what ultimately enables him to make Yellow and Blue see things from his perspective and accept the idea that they’ve been unhappy, despite (or, perhaps, because of) the facades they’ve been forced to maintain. But in empowering Blue and Yellow to speak their truths, and exposing White for being the manipulative, misunderstanding powerhouse that she is, “Battle of Heart and Mind” digs into the core of what’s always made Steven the most powerful gem. As Steven and the other gems are falling in their initial scrap against White Diamond’s giant mecha, the young boy fusing with the still-poofed Gems in order to jumpstart their reformations isn’t just a smart move—it’s the embodiment of everything about the Crystal Gems that makes them such a strong team, a bond that’s been forged ever stronger over the course of the entire series. Outnumbered as they are, the Gems understand that their willingness to fuse with one another is what makes them a team that can handle anything thrown at them, while also respecting their respective strengths. Steven fusing with each of the women who have raised him isn’t just fan service, it’s a radical act in defiance of an authority that would tell him that he’s wrong for doing so. But Steven’s fusions (epic though they are) are not what ultimately saves the day. As powerful as Gems can be, especially when they’re huge, it’s Steven’s appeals to their humanity that turns both the tide in the battle and the other Diamonds’ minds about their relationship with Earth. When the remaining Crystal Gems show up to join Steven’s fight, it’s understood that they never really would have been able to turn the fight, but that’s not the point. They were all ready and willing to fight along his side for a cause they believed in, and whether the Homeworld gems fully understood it or not, that kind of dedication and resolve is a power in and of itself they could never hope to rival. Because Cartoon Network apparently delights in keeping Steven Universe in an existential limbo, there’s no way of knowing whether or not this is the last of the series we can expect to see. But, like so much of Steven Universes’s most recent episodes, “Battle of Heart and Mind” feels very much like an epic swan song. It doesn’t tie up a number of the series’ dangling threads, but instead presents you with the bookend to a story that just feels...right.